Two ESE GAMES campers collaborate on an activity. Most of the camp's sessions were comprised of a mini lecture, followed by a hands-on activity related to the topic. Two addressed environmental issues: environmental footprints and climate change. Several dealt with renewable energy, such as solar, and wind and tidal. In one lesson, after learning about the air pollution produced by cookstoves, students made their own solar cooker. Several sessions also addressed water: water for energy, which included a trip to Abbott Power Plant, and some lessons about water purity, including a lab about water quality done at Boneyard Creek. Campers test the quality of the water in Boneyard Creek. New this summer was a field trip to the Urbana's waste water treatment plant...which compliments the camp’s water quality module. They also incorporated more hands-on data activities and, according to camp coordinator, Nicole Jackson, who admits to being “kind of biased towards my research," there’s more on water resources and agriculture. Jackson acknowledges that “Every year we spruce it up…we tweak it a little. It is a function of who’s helping in a given year.” For instance, one of Tami Bond’s students taught a module on solar cookers. “So, they are going to make s’mores,” Jackson says. 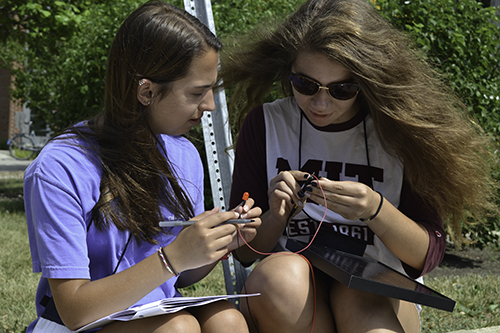 Mary Foltz works with two campers taking measurements using a solar cell. She also indicates that they've been seeing long-term results in terms of campers matriculating to Illinois: at least seven students have applied and been admitted, and from the last two camps, at least one student applied, was admitted, and is currently in Illinois’ Civil Engineering program. Mary Foltz (right) works with an ESE GAMES camper to analyze the results of water quality at Boneyard Creek. 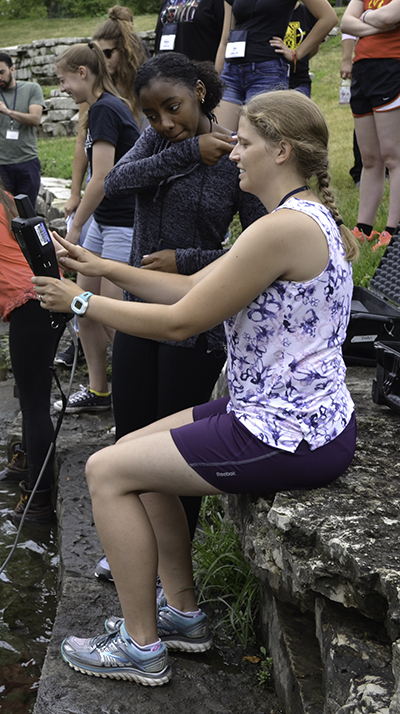 Helping Koloutsou-Vakakis with the camp this year were around 8–10 Civil Engineering graduate students, including one of the coordinators, Mary Foltz, who just finished her Masters in Environmental Engineering and will be starting her Ph.D. in the fall. Helping with the camp for the second year in a row, Foltz got involved because she loves teaching. “I want to be a professor, so this is kind of the right fit for me. Teaching high school is what I did before I came to graduate school, and so this is really similar to that but a little different.” She also hopes to help the campers figure out what they want to do, and serve as a role model. Folz’s favorite activity of the camp? Water quality and water treatment (the one she helped teach, of course), which was done at the Boneyard Creek. ESE GAMES camp coordinator, Nicole Jackson, helps two campers during one of the activities. Two campers make solar ovens. Does Jackson think any of the students might end up to be environmental engineers? “I think there are a few,” she says. “There are a few that are dead set on, ‘I want the planet to be a healthy place.’ I think, though, there are definitely some who are environmentally focused, but may not know how they want to do it in practice, which I think is totally fine and helpful. So, yeah, there’s a lot of eager minds amongst our 20 campers." And several campers believed that they would end up in STEM, and maybe even environmental engineering. Paige Jenekowitz and Nina Crawford do an activity about solar cells. Does she hope to end up at Illinois, too? Like Nina, Paige Jenekowitz, a rising junior at Conestoga High in Pennsylvania, also participated in the camp to check out the field careerwise: “I came here because my environmental science teacher told me about it, and I wanted to be an engineer so she thought this would be a good idea to come here. Similar to Nina, she also thinks she’ll go into environmental engineering, and she’s interested in attending Illinois. 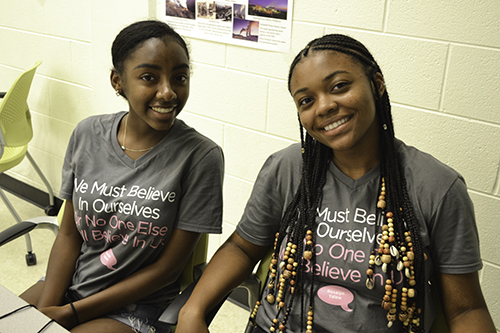 Like the other two girls, Cori Robinson, a rising senior, at Oak Park Forest High School in northern Illinois is also exploring her career options, and came to the camp after her mom told her about it. “I’ve always been interested in engineering. I’ve never been sure of which type of engineering, so I thought it’d be a great experience to be exposed to some other aspects that I don’t usually see,” she says. 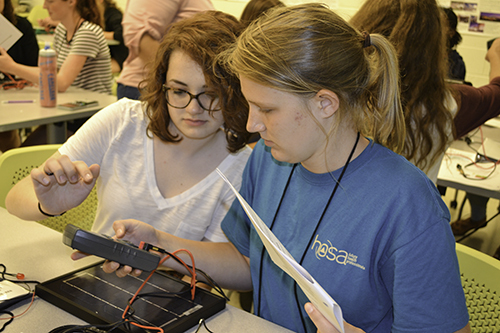 Chloe Walls and Cori Robinson take some measurements using a solar cell. Robinson thinks she might do some type of environmental science and engineering. Does she you think she’ll come to Illinois? “Yes, that’s the goal,” she reports. Chloe Walls, a junior at Homewood High School, shares why she came to the camp: “Because I took environmental science this year, and I really enjoyed it, and I also like physics and engineering, so I thought I should come to a camp and Illinois had one so I'm here. 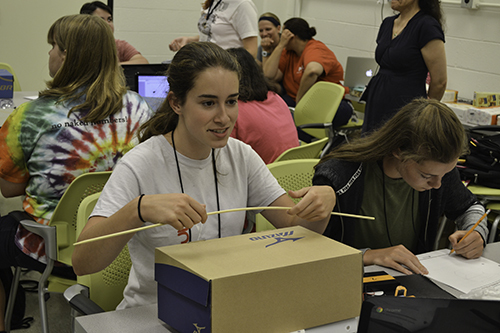 While it’s the first GAMES camp you've been to, she believes it might have tipped the balance for environmental engineering: “It did,” she admits, “because I wanted to see if this was something that I like before I decided to major in it so I thought this would be a good way to try it out but I have enjoyed myself so far." Like some of the other campers, she says Illinois is her top choice right now. Story by Elizabeth Innes, Communications Specialist, I-STEM Education Initiative.